a collection of Farmers Market linens hangs close by. 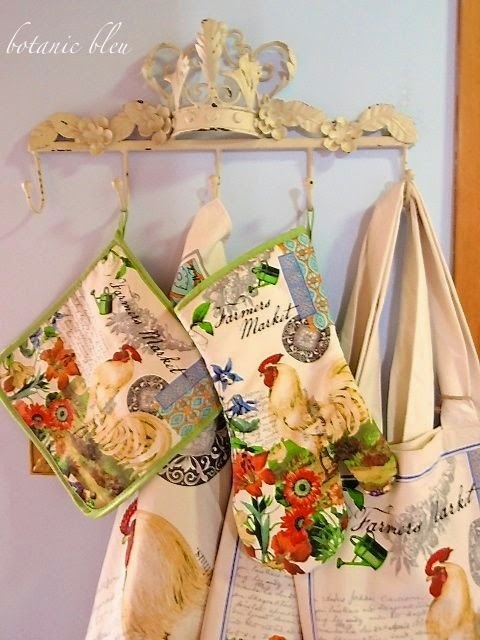 All bring cheer to a French country kitchen ready for the sunshine of spring. in the flower section of the grocery store this week. with questions about whether we should risk buying them. record low temperatures for over two weeks. and were hanging with their faces on the wet muddy ground. wondering if that was enough to fill my white pitcher. Oh, yes, 5 bundles were enough! of overcast skies and frigid temperatures. 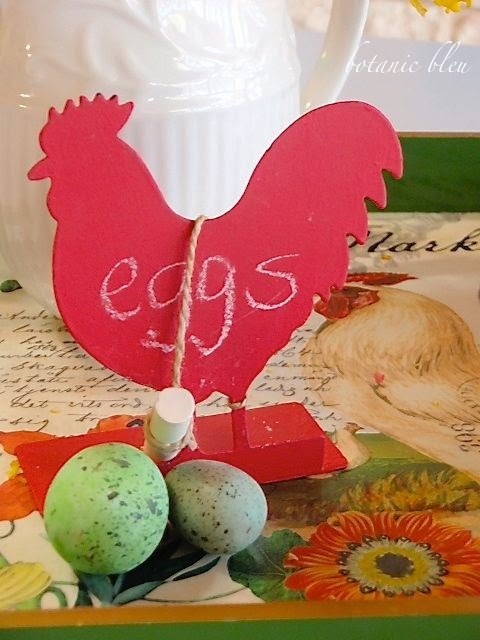 its reminder to buy eggs from the market. A Farmers Market list grew. 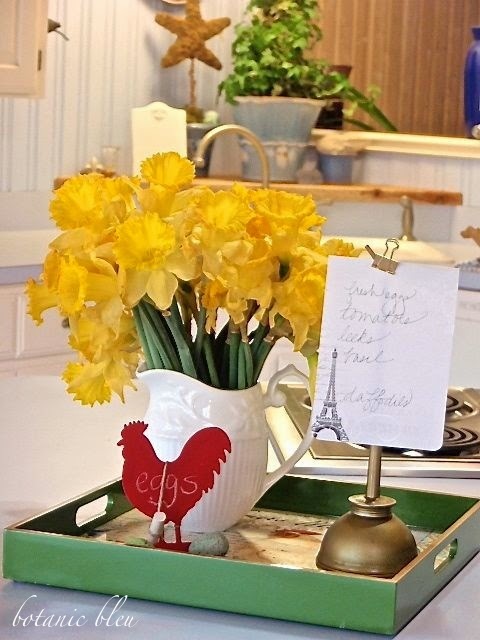 Daffodils are on the list in case there are more at the grocery. 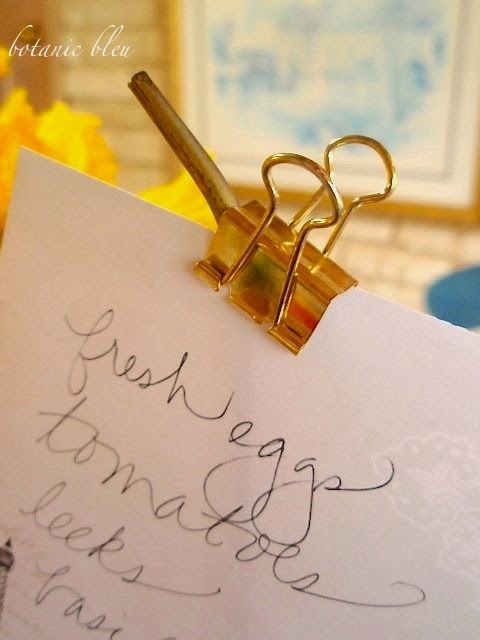 using an office store gold colored bulldog clip. I found this little can at Chipper's antique store near my mom's house. The bottom still has the original price tag of 39¢ stamped in ink. I paid more than 39¢, but still got a good bargain. love its long spout with the bend at the end. While the little oil can is old, it is in perfect condition. AND gives a little touch of France. bright oranges, reds, and yellows, and French script. 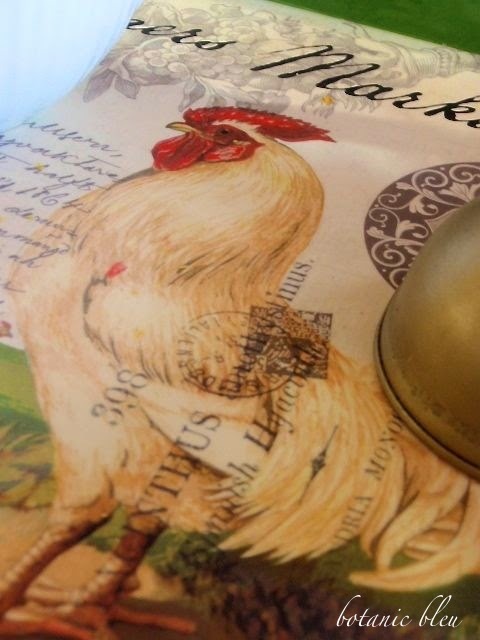 and the new Republic's seal also included a rooster. sports teams use le coq in their logos. adding more bright spring cheer. and bright sunshine flooding the kitchen in almost three weeks. 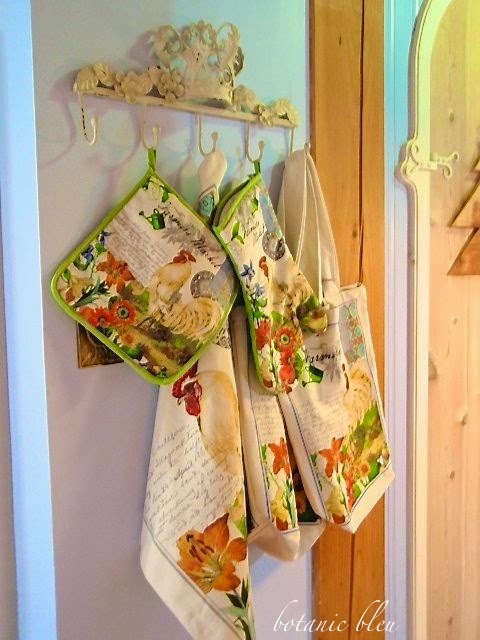 kitchen linens that go with the season hang here. Right next to the crown hooks holding the linens is the coat closet. as going out the door to the market. Bonjour, Judith! There is nothing more simple that can bring such a profound joy, as fresh flowers. The simplicity of buying a bunch, bringing them home, and preparing them for that special vase is one of the pleasures many of us can make happen. I have two vases filled right now with roses, and I intend on keeping this tradition happening for a long time. 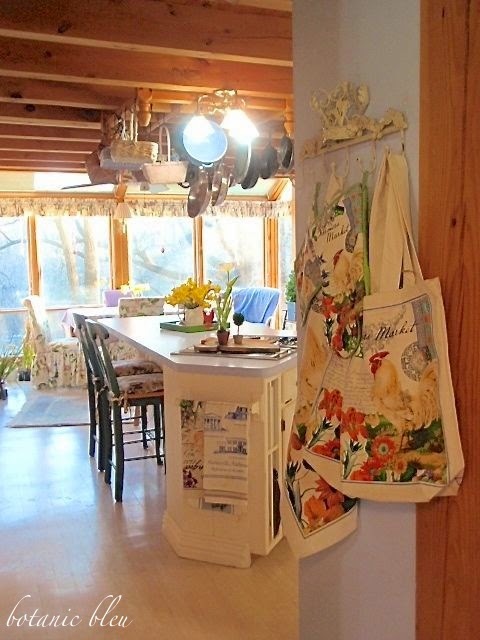 I am completely charmed by your kitchen. An ingenious way to use that darling little oil can. I think it is a perfect use. If I get the chance I'll be copying it. Haha! 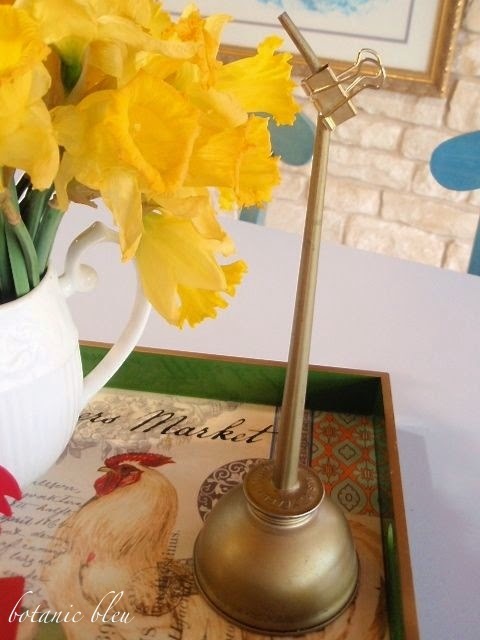 The tray vignette is so fresh and bright. It sings Spring! 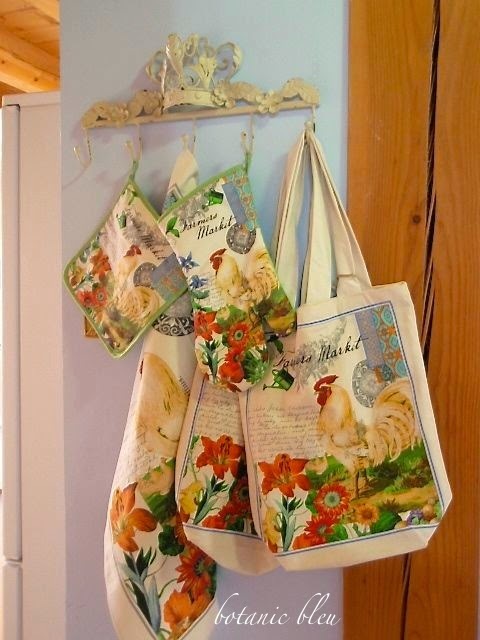 I love all the pot holders and bags. This is the first week in the last month that we will not have snow. Raining, but I can deal with that. Your French Market kitchen is beautiful! You always have the prettiest accessories. Daffodils are pure sunshine! We have had unseasonably warm weather. Our bulbs and blooms are way ahead of schedule. Yesterday we exposed the upper screen on the storm door. We kept the door open until 8pm. It was so nice to let the fresh air inside. I hope that this note finds you well! That is one beautiful color profusion of Springtime. Lovely photos, pretty linens. Very pretty! Bright colors really say "Spring is here!". Judith, I'm happy you have blue skies and sunshine. We are back to grey skies and rain. It's been raining since late last night, and though I'd relish a bit of blue sky and sunshine, the rain is always welcome. 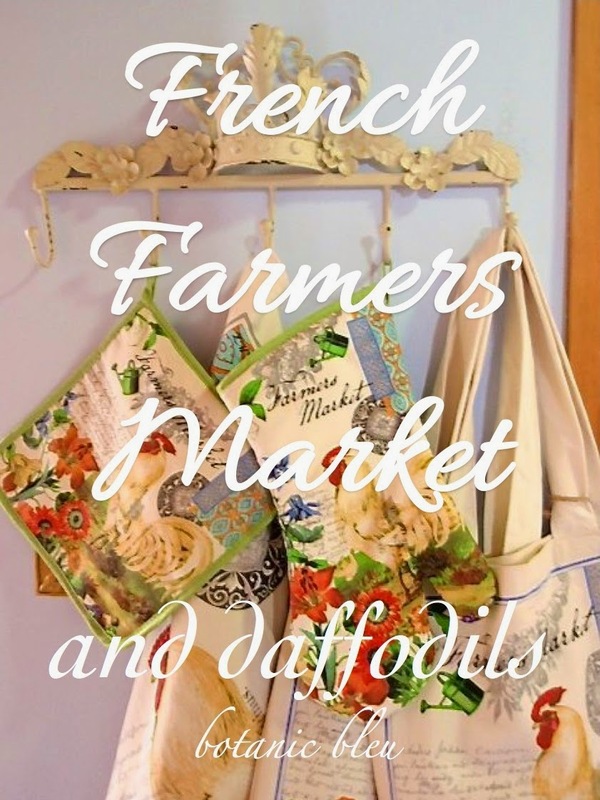 Your French Market theme is refreshing. I always smile when I see shots of your light filled kitchen. You must be happy! Topping it all off with sunny daffodils is the crowing glory. Oh Judith, of course they would have bloomed L@l@K at what they had to look forward to in your beautiful kitchen! It's such beauty like yours that any struggling bloom would awaken to just be that added vase or farmhouse pitcher of floral in your space. They were such a risk, yet you took a chance and woke to a beautiful welcoming spring sight. 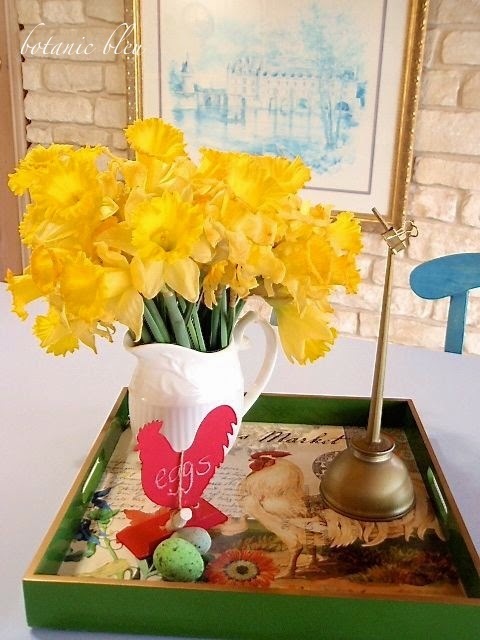 Love the tray, I have a thing for them as well, in fact one sits on the kitchen table waiting on what ever may be filled in it. I have been posting artful French pieces at my place, yet a bundle of daffodils would inspire it all. See you soon and the beauty of your French home. Oh, Judith! Nothing says Spring as well as daffodils! They were $3 a stem when I last looked at our grocery store which was a little pricey for me, but $.99 a bundle! Yes, please! I'll have to look again to see if they are less expensive this week. The oil can is charming. I have a much smaller one that I've had for years just sitting in my studio on a bookshelf. 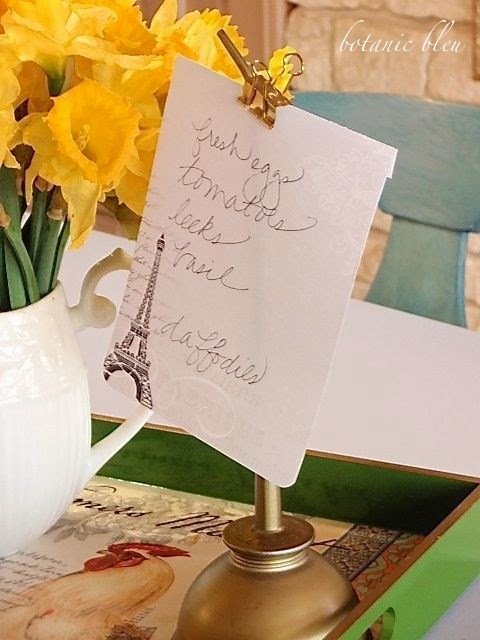 I love the way you are using yours, but I'll need to use a much smaller clip if I copy the idea and a much smaller note size - maybe 3" x 3" would work with mine. As always everything looks fresh and charming. Happy Spring! Hi Judith, Daffodils always mean Spring is right around the corner. They are so pretty in your white pitcher. 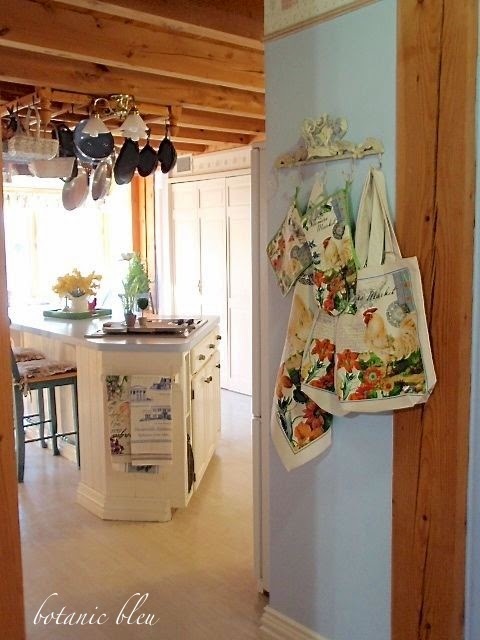 I just love your bright French country kitchen! You've captured the look perfectly! Those great old oil cans are great as ring holders on your dresser or by the sink! 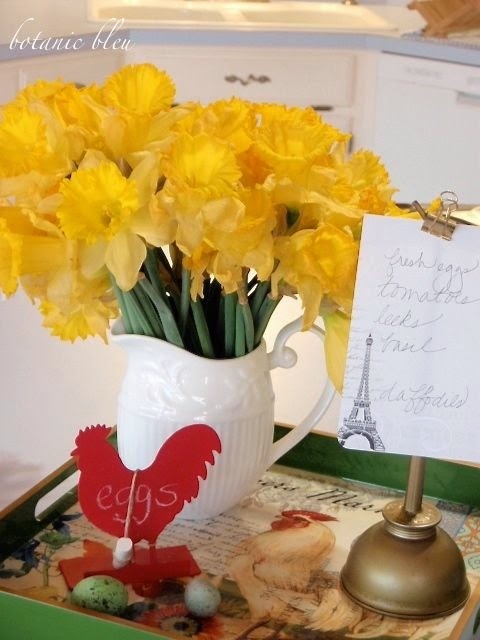 I just saw daffodils at Trader Joe's yesterday and wondered the same thing! I should have bought them! Beautiful display! I would love for you to stop by my blog and join our Something to Talk About link party each Monday-Thursday! It all looks beautiful!! Love daffodils!